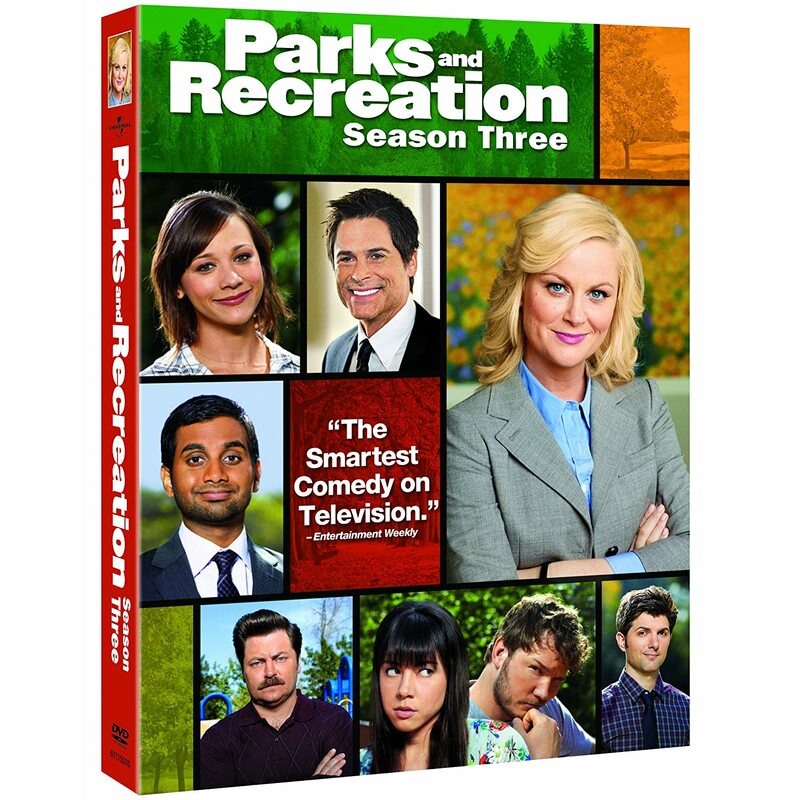 Quick Take: Parks and Recreation, "Time Capsule"
Review: Parks and Recreation, "Time Capsule"
(S0303) First of all, you gotta give me some credit: Breaking Pawn(ee) is a pretty great title for this review of a Twilight-heavy episode of Parks and Recreation. Second of all, "Time Capsule" just didn't really work for me. I think it had a lot to do with the overload of references to Stephanie Meyer's teen vampire book series. It's not that I don't appreciate it being both mocked and somewhat praised throughout the episode, I just felt the plot and jokes that relied on reference to Twilight already seemed very dated. Now, I know that this episode was among the bunch that was filmed immediately after production of Season Two ended last spring, but I would think the references would feel just as dated then. You could make the argument that a town like Pawnee would be behind in the times enough to just be discovering Twilight now (in an earlier episode, Tom makes reference to residents just discovering Nirvana), but the book series is almost too new for that overarching joke to really work either. The Twilight series is almost in a pop culture limbo where it's both too fresh and not fresh enough to really be worthy of satire. Still, all bad vampire literature aside, "Time Capsule" was funny, but a somewhat dull episode among the high reaches that Parks and Rec has been hitting lately. Leslie (Amy Poehler) and company are putting together a time capsule to be opened in 50 years that is filled with items that best represent what Pawnee is like in its current state (and hopefully it will not be including a list of numbers than, when decoded, predict future disasters or whatever the hell was going on in that terrible Nicolas Cage movie that came out a couple years ago). But Leslie's open door policy backfires when a citizen named Kelly who wants Twilight in the time capsule so bad that he handcuffs himself to a pipe in protest when Leslie refuses. Kelly is played by the very underrated Will Forte. I'm probably in the vast minority, but I loved the MacGruber movie. It reminded me off the best Zucker, Abrahams, and Zucker spoofs of the 80s and not the awful Friedberg and Seltzer spoofs of the 2000s. And that's the end of my Will Forte/MacGruber/Spoof Movie tangent. Hope you enjoyed it. He later calls Lucy in to see what he did wrong in their relationship. She explains that she truly cares for him, but she can't be with him until he gets over Wendy being with Ron. And off she goes, likely to be seen again as Tom's character arc continues down the road. Eventually, Leslie does some detective work and finds out that Kelly is staging his sit-in in order to impress his daughter, a real Twi-hard, who has grown distant since Kelly and her mother split-up. Knowing she can't just give into Kelly's stunt, she decides to insert Kelly as something of a ringer in a public forum to discuss other items that the time capsule could contain. But this clearly backfires because the citizens of Pawnee are whack-jobs and want every imaginable personable thing included. Though as Ben (Adam Scott) lovingly puts it, at least they are whack-jobs who care about their town. Ultimately, Leslie compromises and instead of including any of the physical items all of the townspeople fought for, the time capsule will only include a videotape of the forum, showcasing the passion the Pawnee residents showed for their belongings. And she even gives Kelly a boost in his daughter's eyes by hosting a showing of the first Twilight film in the park, for which Tom is very excited. The C-Story dealt with Andy (Chris Pratt) and Chris (Rob Lowe) teaming up to get April (Aubrey Plaza) to fall for Andy again. And it worked, sort of. To be honest, I was kind of confused about how it did. Chris suggests that Andy use his two best qualities (being nice and being in a band) to his advantage in wooing April away from her Venezuelan boyfriend, Eduardo. Andy does so by being nice to and jamming with Eduardo himself. Seeing her two most recent lovers as friends, April is disgusted and sends Eduardo back to Venezuela because apparently she has the power to do this. In any case, this was an odd little resolution to the Eduardo storyline, especially since he was nowhere to be found in last week's episode when April was hospitalized with the flu. I had assumed then that Eduardo was already out of the picture. Suddenly he's back this week and gone as quickly as he returned. I guess the writers have to stretch out the obstacles a little bit (because the last thing the April-Andy relationship needs is the unbearable cuteness of The Office's Jim-Pam relationship), but this seemed like a somewhat lazy obstacle. So while "Time Capsule" was undeniably funny and quotable and included an always welcome public forum scene, it didn't work in the same capacity as the first two episodes of season three have. But maybe this episode was just the calm before the storm because next week's episode is titled "Ron & Tammy: Part 2." Get ready to have your mustache ripped out with excitement. I'm both disgusted by but want to eat the Four Horsemeals of the EggPorkalypse at JJ's Diner. Hey look, it's Shauna Malwae-Tweep again! Ron has a hacksaw in his desk. Obviously. Hey look, it's Marsha Langman (of the Society for Family Stability Foundation) again! All credit given where due ! I hear you on the right timing to hit topical references. It's a fine art to hit the right window given productions schedule on a TV sitcom. One place it worked perfectly in my book was last season when Andy Sanberg's super annoying (and hilarious) park ranger guy would blast out, HAVE YOU SEEN AVATAR? But then again, it's Sanberg.